Dr. Ihor Zachary joined The Eye Centers January 2018. He received his undergraduate degree from Trinity College in Hartford, Ct., and in 1967 his medical degree (MD) from Yale University School of Medicine. He completed his medical internship at the University of Buffalo Affiliated Hospitals. He fulfilled his military service at the National Institutes of Health (the National Institute of Allergy and Infectious Disease), and was in charge of the Serology Research Laboratory at the Middle America Research Unit in Panama, Canal Zone. Subsequently, he completed his ophthalmology residency at The Case Western Reserve University Hospitals and then additional fellowship training in Cornea and External Diseases at the Bascom Palmer Eye Institute affiliated with the University of Miami. Upon completion of his fellowship training, he became Assistant Professor of Ophthalmology and a charter faculty member of the new medical school at University of South Florida. He was in charge of the Cornea Service and the Tampa Eye Bank. 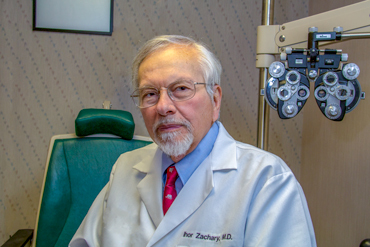 In 1976, Dr. Zachary joined Medical Eye Associates as a comprehensive ophthalmologist providing care for all ophthalmic diseases and surgery. Dr. Zachary has been a Clinical Assistant Professor of Ophthalmology at The Case Western Reserve University Ophthalmology Training Program and has served on the Board of Trustees of the Cleveland Eye Bank. For many years, he had participated in medical mission trips to Ukraine and the former Soviet Union where he provided teaching of ophthalmology and ophthalmic surgery at several eye centers. He has served as a consultant to the “Fight for Sight Fund” which has provided materials and supplies to the schools for the blind in Ukraine and has sponsored several children for treatment and studies in the U.S. For his work and efforts in these areas, he received the “Humanitarian of the Year Award” from the Ohio Ophthalmological Society and in 1997 he was given a Knighthood in the “Order of St. Gregory the Great” by Pope John Paul II. Dr. Zachary is board certified by the American Board of Ophthalmology and is a fellow of the American College of Surgeons. 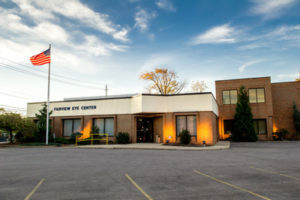 He is a member of many medical organizations, including The Academy of Ophthalmology, Ohio Ophthalmological Society, and the Ukrainian Medical Association of North America. He has been president of the Ohio Chapter of the UMANA for many years.